“These are my people,” Bill Nye said ahead of his lecture to some of the 10,000 science educators who attended the National Science Teachers Association’s (NSTA) National Conference in Los Angeles last week. When Nye, the well-known 1990s television host of “Bill Nye the Science Guy,” vivaciously told the hall full of teachers about how science will help “change the world,“ he was met with thunderous applause. But in fact, it’s this group — teachers on the front lines — who deserve the credit, Nye said. PBS NewsHour met Nye, CEO of the Planetary Society, at his office in Pasadena, California, ahead of his NSTA lecture last Wednesday. 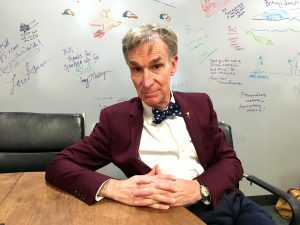 Nye shared his thoughts on science education in the U.S. during a Facebook Live discussion with viewers and a subsequent off-camera interview. He discussed a range of topics, including how to encourage more girls to go into STEM, climate change, and space exploration was a popular topic, too. Teachers in the audience asked about how they could build a model of Nye’s lightsails in the classroom and the significance of NASA’s flagship missions, like New Horizons, the first mission to Pluto. But the main theme of the discussion was how teachers’ passion for science can ignite passion in their students. This conversation was lightly edited for length and clarity. These science teachers at NSTA are pumped, they’re excited, but I think they’re probably also under some stress given things going on, especially just this week, politically speaking. I’m wondering what are you seeing with the state of science education? Well, everybody you meet knows the acronym STEM these days: science, technology, engineering and math. Now you’ll hear STEAM (A for art). And STEAMD (D for design)! And pretty soon, they’re going to call that SCHOOL. At the science teacher convention, we do focus on science. It’s a big concern that we have the world’s third most populous country, the world’s highest producer of carbon monoxide and other greenhouse gases with leadership right now that is nominally anti-science or in denial of climate change at any rate. So this is a big concern for teachers. The other big problem we have here in the U.S. is school boards that get populated by people who say they don’t believe in evolution. That’s wrong and inappropriate for science class. Given those challenges, how do you help teachers raise people’s curiosity for science and get them to have the same enthusiasm and determination that you have? Two things…dinosaurs and space. That’s what we all love. For most of us, that really never goes away. You want teachers who are passionate and who pass their passion on to the students. We want to get kids excited about science for their whole lives. Now it’s generally agreed that 10 years is about as old as you can be to get a lifelong passion. We also want people to have a good grounding in science. It doesn’t mean we want everybody to become a scientist. And I will tell you as a professional engineer with a professional engineering license, we do not want society to be nothing but engineers. No, the fashion challenges alone would be very troubling. These people at the science convention this week are on the front lines. So they fight the fight. But what is good is generally the very top students are still generally doing very well in the U.S. and Canada. But we want to engage everybody, especially now with climate change becoming an increasingly important problem. Let’s talk about one group of young students in particular: girls. How do you empower young women, and especially young women of color, to pursue the STEM fields? There’s a period where girls are just better at everything. And that’s right about at 14 years old. They mature more quickly. Their brains are bigger. So historically we’ve had traditions that I think we can overcome. Now, bear in mind, I’m not objective about this. I respect the data, for sure, but my mom was really good at math and science. She didn’t become a full-time scientist, but she went on to get a doctorate. I respect that. No kidding, my mom would say, “teach a woman to fish, she’ll eat the rest of her life.” I think if you come to the science teacher convention you’ll see that everyone is working real hard to engage girls in science. And we can do this. If you’re a parent, the big thing you can do is emphasize algebra. We have a tradition of not empowering or raising the expectations of girls in algebra, but you’ll find that the very best mathletes are girls. Let’s have high expectations in algebra because apparently algebra is the single most reliable indicator of whether or not a person will pursue a career in math and science. I was struck what you said about your mother. Is it true she was a codebreaker during World War II? Apparently, I mean, I don’t know what she did, but she kept it secret. She definitely was in the Navy and worked in the same room that they worked on the Enigma Code. I don’t know what she really did. Was she just a gopher in the office? But I will say objectively she was very good at puzzles. My mother really liked puzzles. Bill! Bill! Bill! Bill Nye The Science Guy joined NewsHour Extra’s Vicky Pasquantonio to discuss ways of empowering kids to pursue science, ahead of his appearance at this year's National Science Teachers Association conference. Bill Nye and the NewsHour’s Victoria Pasquantonio chat about his favorite story from “Bill Nye the Science Guy,” how to empower girls to pursue science, what he would do if he were king of the science-education forest, and what to say to a teacher who doubts climate change. So did your parents inspire you? Oh, yeah, boy scientist—it was my dad. And my mom’s father was an organic chemist, and she gave me his glassware to play with. In those days, chemists had to blow glass. My nephew is a chemical engineer, so is his wife. They’re both PhDs in chemical engineering, which is unusual. But they use software, ChemDraw, that my grandfather probably never even imagined, let alone used. So different eras, people had different skills. I used to work on a drawing board. No one works on a drawing board. Now it’s electronic, as it should be. What do you mean, like geology? I hope so. Like in terms of going back and studying it on a chronological level. Oh, there’s a lot to that, because you see how people are thinking. They used to believe in something call caloric, which is a heat flow of some kind, and that theory didn’t work. People reasoned that heavy rocks fall faster than light-weight rocks without quite appreciating this business of aerodynamic drag. So one thing leads to another. I mean that’s not a bad thing. Do you want to start now and work backwards? Yeah, I know, because the danger of that is you might think we’ve come as far as we can go—like in Kansas City. Isn’t that where it was? Things are up to date in Kansas City. They’ve gone about as far as they can go. They’ve gone about as fur as they can go. That’s not quite true. They’ve gone a bit further than that in Kansas City. I’ve been there. They have electric lights now. I talked to one science teacher who wanted me to ask you, when is the last time you did long division, or had to walk in a straight line, like kids have to do at school? On Sunday — I was doing some carpentry at home. And I had to divide something into thirds. Yeah, what? I think his point was: Are we teaching kids the right way? Oh, because now you can get a computer to do the division for you. You’ve got to learn basic skills, and you’ve got to learn how to use a machine. For crying out loud, it’s not one or the other. I used a slide rule, Guy Asking Cheeky Question. And due respect, I’m of a certain age, and on a slide rule, I’d probably kick your a**. I was showing somebody how to use it on the writing staff of “Bill Nye Saves the World” [Nye’s Netflix show coming out in April], and I was getting the answers, and I had to really stop and go back. How did I get that? How did I do those three or four numbers so fast? I had to go back and go step by step. That’s what we did. But long division. You better freaking learn how to do long division. And you better take a little bit of philosophy and do some ‘if-thens.’ Yes, you gotta do it all, man. I’m raising my voice. What is the importance of teaching students to work in multidisciplinary groups? It’s not important at all. Kids don’t need to learn to write. They don’t need to learn anything about math. They didn’t need to know anything about geography. Does that answer your question? Of course! You want multidisciplinary things. Kids — everybody — has to learn how to write and work together. Kind of like how the James Webb Space Telescope is an international collaborative effort? Yes, it’s cheaper for each space agency when you work together. Generally, the overall cost of the mission will be higher because there is time, energy and effort spent at coordinating the organizations, but the cost per organization is much much lower. That’s the idea. It’s great. It brings out the best in us. Victoria Pasquantonio is education producer at PBS NewsHour. She taught middle and high school social studies and English for 13 years and heads up NewsHour Extra, NewsHour's teacher resource website.